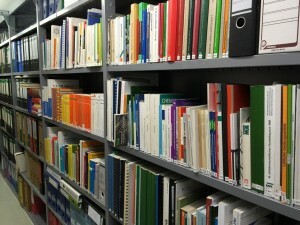 The SASE hosts the "Deutsche Abfallwirtschaftsbibliothek" (German library of the waste processing industry) – the DABib. The dedicated collection owned by the environmental technology research group of the University of Weimar has been saved from destruction by activists from the waste management sector and has been made accessible to students, researchers, scientists, technicians and engineers. Currently the collection consists of 16.000 books, sundry periodical literature and close to 2000 of these addressing the topics of waste management and avoidance. Every year the library is growing thanks to donations and bestowals from the industry. The key subjects of the collection are composting, waste incineration, and recycling as well as international research papers covering the broader waste topic.